Situations of Bullying more than often involve more than just the bully and their victim. They also involve bystanders—people who just watch bullying happen or hear about it. A new strategy for bullying prevention spotlights the powerful role of the bystander. Depending on how bystanders respond, they can either add to the problem or be part of the solution. Bystanders very rarely play a entirely neutral role, even though they may think they do. Some bystanders . . . instigate the bullying by urging the bully to begin. Other bystanders . . . encourage the bullying by laughing, cheering, or making comments that further stimulate the bully. And other bystanders . . . join into the bullying once it has begun. Most bystanders . . . submissively accept bullying by doing nothing and just watching the situation. Quite often without knowing it, these bystanders also add to the problem. Passive bystanders gives the bully the audience and attention bully craves and their silence in watching the situation happen allows bullies to continue their distructive behavior. 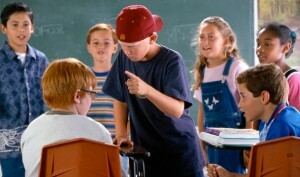 Bystanders also have the power to play a major role in inhibiting or putting a stop to bullying. Some bystanders . . . get involved, by objecting to the bully, standing up for the victim, or changing the situation away from bullying. Other bystanders . . . get help, by gathering support from peers to stand up against bullying or immediately reporting the bullying to adults. Why don’t more bystanders get involved? They worry about getting hurt or becoming another victim. They feel there is nothing they can do to stop the bully. They don’t like the victim or believe the victim “deserves” it. They don’t want to attract attention to themselves. They fear the bully will seek payback on them. They think that telling adults won’t help or it may make things worse. They don’t know what to do or how to do it. Adults can assist children in becoming helpful bystanders by talking with them about the different ways bystanders can make a difference, and by letting them know that adults will support them, if and when they let an adult know of the situation. Adults can also give examples of how helpful bystanders have shown courage and have made a difference in real-life situations and in their own experiences with bullying.